- Sari Colt on 四月 10, 2016. The month of April is known for rainy days, robins chirping and Ginapalooza Canada 2016, celebrating all things gin. At the second annual Ginapalooza, running in Toronto from Apr 6- 20 and followed by Montreal, Calgary and Vancouver, participants are given a passport with the option to check out ten Toronto venues that each feature different brands of gin. At each venue, there are three curated gin based cocktails to try and a stamp can be earned. Each stamp gives an entry for the grand prize of a trip to London, England, the home of gin. The gins featured in the two-week event include Aviation, Beefeater, Boodles, The Botanist Islay, Bulldog, Death’s Door, Plymouth, Sipsmith, Toronto Distillery and Victoria. The participating venues are Bar Batavia, Chantecler, Civil Liberties, Kohl, Montauk, Parts & Labour, Peter Pan Bistro, Rush Lane & Co, Thompson, and Thoroughbred. At the Thompson Hotel, the gin cocktails are crafted by Chris McCrabb and Jeff Puddy. We sampled the Thompson + Tonic (Beefeater London Dry Gin, Thompson house made tonic syrup and soda water), Boodles Club Cocktail (Boodles London Dry Gin, green chartreuse, St. Germain elderflower and fresh lime), and Scots Do It better (The Botanist Islay Dry Gin, Luxardo Maraschino, Cointreau, grapefruit bitters, tea and basil infused ice). Beefeater Gin‘s Ryan Powell walked us through a tutored gin tasting. Powell explained that juniper is the essential ingredient for gin. Beefeater Gin is a London dry gin made up of 9 botanicals that have been steeped for 24 hours at 78 degrees celsius. The botanicals are juniper, angelica root, angelica seeds, liquorice, almonds, orris root, coriander seeds, Seville oranges, and lemon peel. Beefeater, made in downtown London, was created in the early 1800’s by James Burrough (who at one time lived in Toronto). There are five styles of gin: London Dry, Plymouth, Old Tom, Genever, and International. As a London Dry gin, Beefeater is bold, light bodied and very dry, which makes it perfect for gin and tonics and dry martinis. 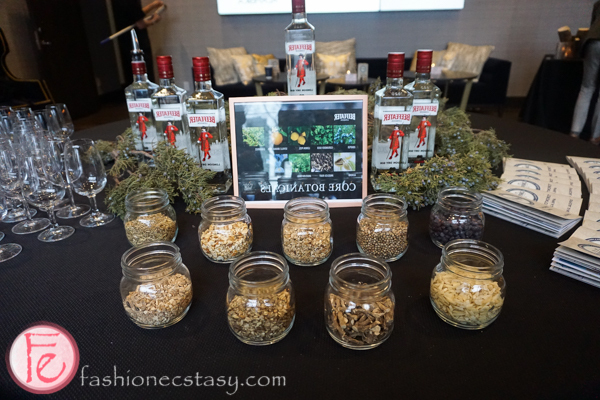 Powell said that the gin category is growing in popularity, and more bartenders are creating inspiring gin drinks..
A launch party to kick off Ginapalooza 2016 was held at the Thompson Hotel Toronto where delicious appetizers were served to complement the gin cocktails. We tried vegetarian gnocchi, citrus quinoa and couscous. Eat Joe Cake designed a unique cake truffle which had a citrus cake base filled with blackberry juniper infusion, topped with rose, hibiscus, pistachio and gold flakes.